90 second High Pressure Low Velocity Spray System. Available in 3 levels of intensity and anti aging moisture spray. Why get a Spray Tan? ​What is the advantage of a Spray Tan over UV tanning? ​How Does Sunless Tanning Work? ​The principle tanning agent used in all self-tanning formulas is dihydroxyacetone (DHA). This ingredient does not produce a "real tan" by increasing the skin's melanin levels, rather it creates a tanned appearance by developing a brown color on the surface of the skin. The action of DHA is limited to the upper layer of the skin and involves a reaction between DHA and skin proteins and oxygen that produces brown compounds. This process is similar to what occurs when you slice open an apple and the surface of the apple browns when it's exposed to the oxygen in the air. The development of color takes anywhere from 2 to 4 hours and the intensity of color is dependent upon the DHA concentration in the product as well as each tanner's individual skin characteristics. The color developed by the DHA usually lasts 5 to 7 days and begins to fade as the top layer of the skin naturally exfoliates. YES! According to the American Academy of Dermatology, the most effective products available are sunless or self-tanning products that contain dihydroxyacetone (DHA) as the active ingredient. DHA has been used in cosmetic preparations for almost 30 years and was listed with the FDA in 1973. It is declared safe and suitable for use in cosmetics and drugs used to color the skin. DHA is derived from glycerin (vegetable origin), which is a commonly used cosmetic and food ingredient. DHA is not absorbed into the body and poses no possibility of toxicity. Attire for women is whatever you are comfortable with. Many things can be done to minimize tan lines. Maui Tan provides complementary disposable bandeau tops and briefs. Common attire for women is swimsuits, undergarments, or disposable tops and briefs. The key is your comfort level. Attire for men is boxers, swim trunks or shorts. Your tanning specialist will use the utmost discretion. Loose fitting clothing should be worn immediately after an Airbrush Tanning Session. ​How Long does a Spray Tan Last? The longevity of a spray tan depends on the type of self tanning application, the skin's natural exfoliation process, and on the skin care regimen followed before and after application. 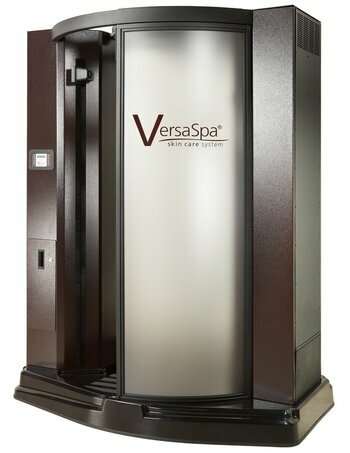 On average, self tanners last 3-6 days for Versa Spa but longer for custom. A professionally application such as a Custom Airbrush Tan, will last longer than an at-home application, about 5-8 days, since there is usually a greater percentage of DHA used. The "life span" of a sunless tan also depends on your skin's natural exfoliation. The faster your skin turns over, the faster the sunless tan will fade. The tan created by the DHA affects only the top layer of the skin and will begin to fade after 4 to 5 days as the skin naturally begins to exfoliate. Following a good skin care regimen before and after sunless tanning will help a sunless tan last longer. Exfoliating prior to a sunless tanning application and keeping skin moisturized afterwards are essential. Sunless tan-extending products with a light self-tanning bronzer, like Norvell's Prolong tan extending lotion, help hydrate skin and maintain even, natural-looking color longer. ​How long should I wait after a Spray Tanning session before I shower? It is best to wait about 8 hours after a Spray Tanning Session or using a self tanner before you bathe or shower to give the DHA time to fully react with skin proteins. We recommend 12 hours or longer for best results. Why is keeping skin moisturized essential to maintain great sunless results? It is important to keep skin moisturized after sunless tanning as dry, flaky skin will slough off faster and color will fade sooner. You basically want to slow down your body's natural exfoliation process. Sunless tan-extending products with a light self-tanning bronzer, like Norvell's Amber Sun Prolong, help hydrate skin and maintain even, natural-looking color longer by providing subtle bronzers. Will my spray tan come off on my clothes? If you are using a spray solution with a cosmetic bronzer, some of the bronze color may rub off on clothing or bed sheets. This is most likely to happen when you get dressed immediately after tanning. To minimize the chance of the tint transferring to clothing, we recommend that you wear loose-fitting, darker clothes after your spray session. Try to refrain from physical exertion that could result in you sweating until you shower and wash off the cosmetic bronzer. The cosmetic tint is water-soluble. Therefore, in most cases, the color will come out of clothing in the wash.
​Can a person UV tan on top of an Spray Tan? Of course! But just remember that Sunless Tanning does not provide any sunscreen protection, so you should apply sunscreen accordingly. ​What if a person normally can't get very tan? A person CAN get a sunless tan even if they can't get a real tan. Sunless tanning does not need a person's melanocytes to be in working order. Dihydroxyacetone (DHA), the active ingredient in Sunless Tanning, saturates the dead skin cells in the outermost layer of skin, where it turns the protein in the dead cells golden tan.